Through the first three days of last season, scoring had risen 4.5 PPG and 6.6% from the previous year. This year? A different story. 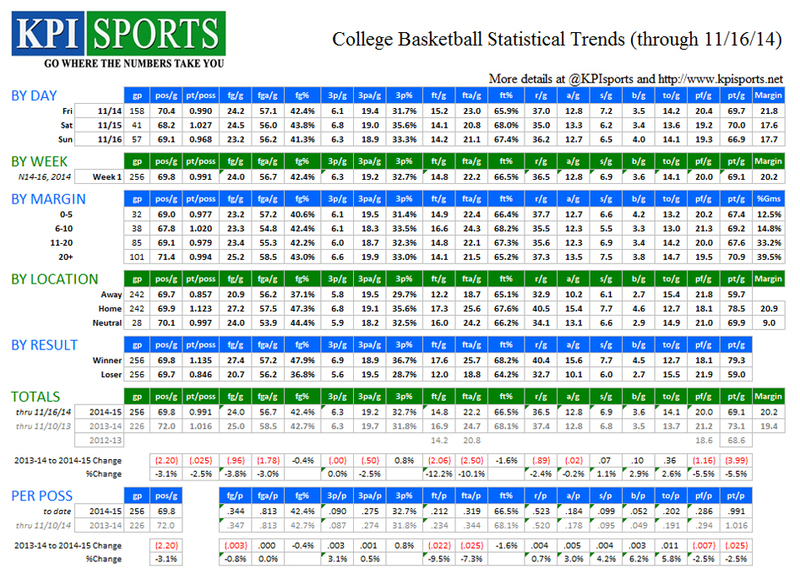 Scoring is down 5.5% and back closer to levels seen before the highly publicized rule changes in 2013-14. Fewer fouls have been called, and fewer free throws attempted. There is an increase in steals and turnovers (both those numbers notably dropped in 2013-14). The pace of play is also slower, as the average length of possession is 0.53 seconds longer. The sample sizes are very similar – the first three days of both this season and last. The scheduling concepts are also similar, though there are a few more games this year (256 to 226) because the season is a week shorter and scheduled more tightly. It is tough to identify the cause of the change and it is important to note that there remains a slight increase in 2014-15 relative to 2012-13. That said, 87.8% of the scoring increase we saw the first three days of 2013-14 is now gone. All data points below compares the first three days of the 2013-14 season and the first three days of this year and is computed on a per team, per game basis. Possessions are down 2.2 per team, per game (from 72.0 to 69.8), a decrease of 3.1%. Scoring is down 4.0 points per team, per game, a decrease of 5.5%. With possessions also down, points per possession are down 2.5% (from 1.016 to 0.991). Scoring in 2014-15 remains up 0.55 PPG from the first three days of 2012-13. 7% of the scoring decrease is tied to fewer made free throws, 48.2% from fewer made 2-pt field goals and 0.1% from fewer made 3-pt field goals. The average length of a possession was 16.75 seconds over the first three days of the 2013-14 season, while the average length has been 17.28 seconds to date this year (an increase of 0.53 seconds per possession, up 3.1%). Field Goal Attempts per possession are nearly constant. 3-pt field goal attempts per possession are up slightly (0.5%), but 3-pt FG% is up from 31.8% to 32.7%. Rebounds per possession are also nearly the same. Free Throw Attempts are down 10.1% (2.5 FTA/game), and down 7.3% per possession. Free Throw Percentage is down to 66.5%. While still very early, this would be the lowest full season FT percentage since 1957-58 (66.4%). Steals per possession are up 4.2% and turnovers per possession are up 5.8%, reversing a trend that was tied directly to the increase in fouls and free throw attempts last year. Personal fouls are down 5.5% per game (1.16 per team, per game), down 2.5% per possession. 7% of games so far this season have been decided by 11 or more points. The average margin is 20.2 PPG. Division I teams are 68-0 against Non D-I teams this season. Home teams went 217-25 (.897) this weekend. There were also 14 games played at neutral sites.